A quaint White Wood Chapel with hardwood floors and gothic windows conveniently located in the city of Gatlinburg, TN. We are in the heart of the Smoky Mountains up on the Great Smoky National Park. We perform weddings Monday through Saturday. Times vary. It's best to always call to make your reservation! Depending on the number of guests you are having, we offer ceremonies in the Chapel's sanctuary or in front of our two story waterfall. Keep it simple and stress free. Our wedding coordinators can assist you in every detail of the planning. Elopement and Simple Gatlinburg Weddings, Cheap Gatlinburg Wedding Packages, Intimate Gatlinburg Weddings. 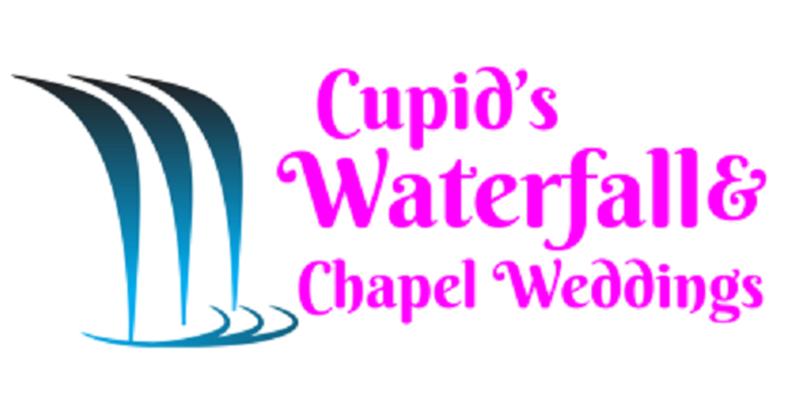 We do it all at Cupid's Waterfall and Chapel Weddings, even vow renewal ceremonies. Our intimate wedding areas: Small Waterfall can accommodate up to 6 guests. The Chapel's Sanctuary can accommodate up to 40 guests. Located near the Great Smoky National Park, Dollywood, Pigeon Forge, the Titanic Museum, Ripley's Aquarium and much, much more.